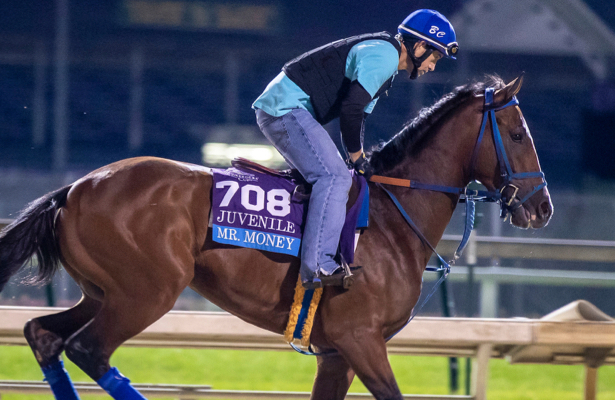 Following a fourth-place run in the Breeders’ Cup Juvenile at Churchill Downs, Mr. Money shipped to Fair Grounds for a small break before returning to the work tab. Trainer Bret Calhoun is now preparing the colt for his 3-year old debut on the 2019 Kentucky Derby trail. The Grade 3, $200,000 Lecomte Stakes kicks off Fair Grounds’ Derby prep season Jan. 19. The 1-mile, 70-yard race is worth 10 points to the winner, with looking to add to his two points collected from the Breeders' Cup. Calhoun said he is likely to continue on the Louisiana path with Mr. Money. Following the Lecomte, the Feb. 16 Risen Star (G2) is next on the schedule and the March 23 Louisiana Derby (G2) marks the final Fair Grounds prep. Mr. Money, a $130,000 Keeneland September Yearling Sale purchase for Allied Racing Stable, LLC, had his first work back Nov. 28 at the New Orleans track. He recorded a half-mile breeze in 49.20. Calhoun said the Goldencents colt has continued to develop, and it was the maturity he showed from his three prior starts that convinced the trainer to enter the him in the Breeders’ Cup. Mr. Money had only broken his maiden at Churchill Downs Sept. 28, but the fact he could run out of his own stall helped Calhoun make the decision. Mr. Money made his debut July 21 at Ellis Park. He went three paths wide in the turn and chased the pacesetter home for second in the five-furlong event. It was another five lengths back to third. He raced at the Pea Patch again Sept. 2, going seven furlongs, and was bumped down the backstretch before turning five wide. He crossed the wire third, but was elevated to second when the stewards moved runner-up Proud Nation to ninth for interfering with Mr. Money early in the race. With a clean trip stalking the pace at Churchill Downs, Mr. Money then pulled away to win a 1 1/16-mile maiden special weight event by 3 ¾ lengths. He took a major step up to run fourth in the Breeders’ Cup with a bobble at the start, finishing behind likely champion Game Winner, Grade 1 winner Knicks Go and Signalman, who won the Kentucky Jockey Club Stakes (G2) in his next start.